The Rush is a hunter's neck knife that is perfect for all outdoor activities when you need quick and easy access to your knife blade. This fixed blade knife is designed with a 3" drop point blade and a tan G10 handle for a 6 3/4" overall length. The blade is black coated 440C stainless steel. 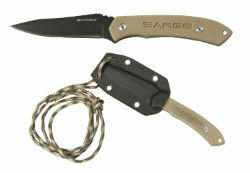 The knife hangs around your neck with a camo para-cord and snaps into a molded black kydex sheath. Our beautifully designed hunting knife is something you've got to take on your next duck hunt! GREAT FISHING KNIFE!